Braamfontein Alive: Transform DJS: People in my community. Transform DJS: People in my community. Are you prepared Braamies as Transform DJS are coming to our hood? Is going to be a blast at the South Point groove on 12th March, 2016(Saturday) at 3pm. 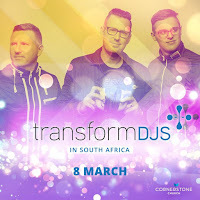 Cancel all your appointments except if they are for Transform DJS as it promises to be an awesome experience as these Christian DJS from the United States of America dig out electric beats to our delights. One more thing, make sure you didn't come alone or leave your dance shoes at home. Come through and experience a new life meeting with wonderful and godly people across all Cornerstone Church assemblies in Johannesburg. Braamfontein Alive would be there and it will be great to welcome you all to our hood as we all love you!